of the Lord Jesus Christ – through faith. We represent this vision using ‘the wheel’. Our vertical relationship with God is represented by the vertical spokes of the wheel, prayer and study of the Bible. 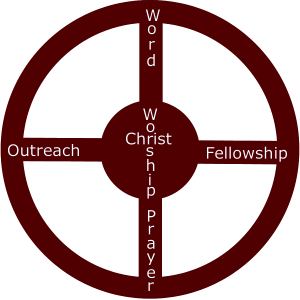 Our horizontal relationships with others are represented by the horizontal spokes of the wheel, fellowship and outreach. 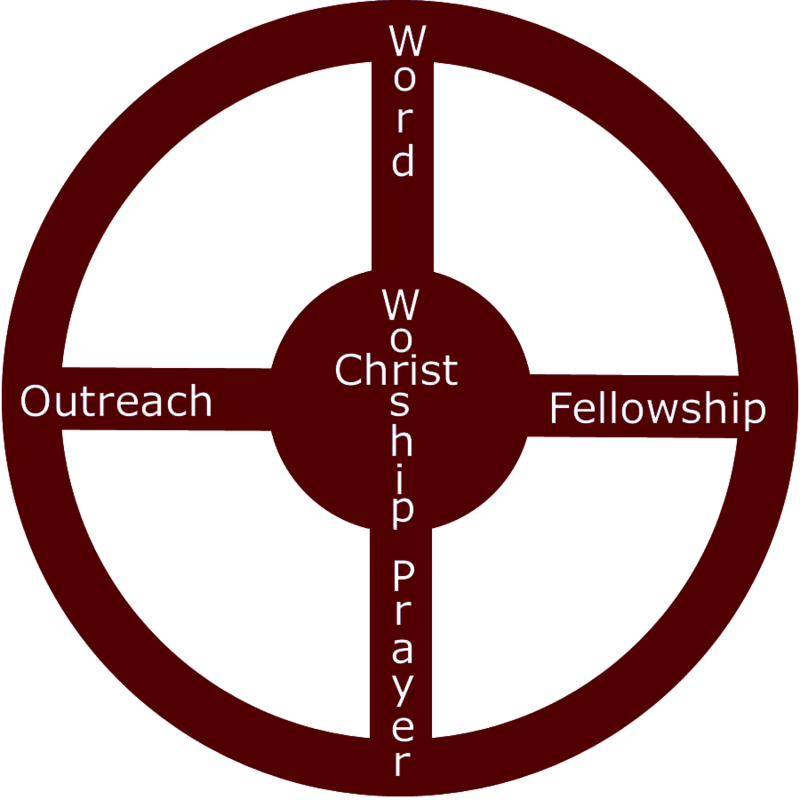 In the center of the wheel is our relationship with Christ, characterized by a heart of worship that motivates and energizes our prayer, our study of the word, our fellowship and our outreach. As a church, we want to be a group of people who are growing to maturity. This process begins when a person hears the good news about Jesus and places their faith in Him. Therefore one key purpose of our existence as a church is sharing his love with others all around the world – but especially with families in our own community. We want to tell people the good news that Jesus died on the cross for their sins, that He rose from the dead on the third day, and that forgiveness and eternal life can be found through faith in Him. Once a person has crossed the line of faith and believes in Jesus they begin to grow in the Christian faith. The purpose of many of our church’s programs and events is to encourage that growth. Some of these programs focus on learning and obeying God’s word – Sunday School, for example. Others help us to depend on Him in prayer, a key component of growth to Christian maturity. Still others emphasize loving and caring for one another. Some of the things we do, such as Sunday morning worship, include all these components of growth. Our beliefs are well expressed by the Evangelical Free Church of America Statement of Faith.